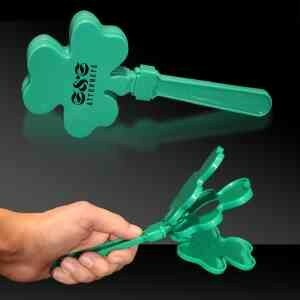 Need a fun St. Patty's Day promotional product that won't break the bank? Check out our green shamrock hand clapper! This 7 1/2" high quality plastic noisemaker is sure to give your message or logo an extra of bit of luck. Great for bars, restaurants, nightclubs or any business wishing to celebrate St. Patrick's Day, order yours today and hand out this lucky promo during your upcoming event! Choking hazard, not for children under 3 years. Imprint size: 2 1/4" x 7/8",1" x 1 7/8"